Making payments online has become a standard part of our everyday lives. Whether it be online shopping, ordering takeout, paying bills, etc., almost all merchants accept credit cards as a form of online payment. What’s more, tech giants such as Apple have come out with applications to allow users to pay for things with their smartphones and smart watches, with credit card information already connected to Apple Pay. Stripe is an American tech start-up company that helps individuals and businesses make payments online. 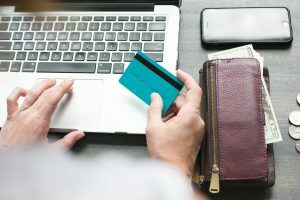 It is the intermediary, allowing companies to use its services to set up online payments through their websites, and ensuring safe payments made by visitors. How does it work? Stripe has designed an application program interface (API), which is a set of protocols and tools for building software applications, that allows it to manage a websites online payment needs. The company can provide services for various types of payment processing, such as e-commerce, monthly subscriptions, or crowdfunding platforms. For example, Uber competitor Lyft uses Stripe to manage their large-scale payments so that riders and drivers connect as quickly as possible and allow payments to be processed on both ends. Other notable customers include Facebook, Slack, and the U.K. government. Today, the company announced a new toolkit called Elements that will allow users to build personalized checkout experiences. What was the motivation behind this launch? The company wanted to help tackle the problem of users putting items into their online shopping carts and then not completing the checkout process. In a survey the company took, they identified key problems with checkouts on e-commerce websites, and used these issues to create Element. More and more businesses are opting to use Stripe due to the ways in which they simplify one’s checkout process and make it easy for the business to add code to pre-structured building blocks. You can try out Elements on their website now! When e-commerce giant Amazon launched its smart speaker Echo in 2014, it was the first technology of its kind that many people had seen. Since then, few updates have been added to the voice-controlled speaker. It was essentially an audio player that contained a Siri-like assistant inside of it. So, what came out in yesterday’s release? Amazon announced the launch of the new Echo Spot – a smart alarm clock with a multitude of capabilities. The alarm clock has a 2.5 inch touch screen, the ability to make phone calls, and can be connected to external speakers to allow users to chose their ultimate audio preferences. The hope with Spot is that buyers will use it as more than just an alarm clock, but as a speaker that can be used throughout the home and for various purposes. Since the original Echo has not be updated since the first release, Amazon decided to come out will the Echo Plus – the perfect competitor for Apple’s latest HomePod. Some perks of the latest version include a higher quality sound, a range of coloured sleeves, and the ability to connect with other smart home devices. Of course, the new Echo still uses Alexa, and all the updates she has developed since the initial release. What makes the product more smart-home friendly is the fact that it comes already compatible with 100 different companies and brands in the home, such as Philips light bulbs. Another update, a cheap add-on called Echo connect, will allow Echo devices to connect to landlines and place phone calls. 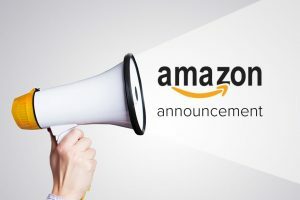 Again, this will be done through voice activated commands, and is in line with Amazon’s goal of connecting more devices to enable a truly smart home. Most of these devices will be available before 2018, and some are already available exclusively to Amazon Prime members. Upgrades and improvements in personal and home security are always being released on the market. Especially in today’s society of ‘smart’ devices, there is a unique need for everything to be more connected, and this does not stop at one’s small personal devices, but to appliances, machinery, and even our homes and vehicles. Recently, there has been a huge market for smart technology relating to home security, such as keypads, locks, doorbells, front door cameras, and much more. Some of the perks include key-less entry; meaning friends, family, cleaners, etc., can enter your home without always in possession of a key. Further, many companies allow the lock and keypad to be directly connected to a user’s phone, meaning they receive notifications and live updates for when their door is opened and closed, locked and unlocked, and further allows you to lock the door from your workplace, or the grocery store, if you forgot to do so. Another popular device is a doorbell cam, that shows the homeowner who is ringing the doorbell, standing on the front porch, or what time a package was delivered. Even more interesting, the device is programmed with speakers and audio, so you can speak to whomever is at your door when you aren’t physically present. 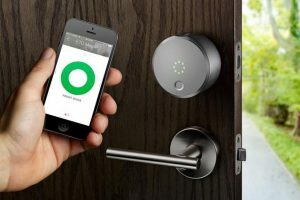 These products are becoming very successful, so it is no surprise that larger companies are wanting to collaborate with smart lock makers to create a mutually beneficial business idea. Enter Walmart, who reached out to August, a smart lock company in the US. The idea is simple: online orders placed through Walmart.com will be shipped and delivered to your doorstep as per usual, except the delivery person will now be able to enter your home to drop off the package, and if you ordered cold or frozen food, they will place it directly in the fridge or freezer. How convenient! To ensure ultimate safety, homeowners will be able to watch the entire delivery unfold in real time from their smartphone. The code given to the delivery service will also only work one time, so re-entry is not a risk. Walmart currently uses delivery service ‘Deliv’ which began through Sam’s Club last year. Experts say that this is just the beginning of what we will start to see as the battle between companies like Walmart and Target face against e-commerce giant Amazon. In 2016, Shopify launched Kit Favours as a premium feature for users. Kit is essentially a virtual employee that handles both inbound and outbound marketing services for Shopify merchants. Kit’s tasks include; inventory management, Facebook advertising and customer email, to name a few. All of these helpful tasks Kit is responsible for are controlled by the Shopify merchant via SMS message, Facebook Messenger or Telegram. Evidently, Kit has been a popular merchant tool that has increased efficiency and improved customer relation management. Until June 7th, 2017, Kit was only available for premium users; however, the virtual employee is now a free feature available to all members on Shopify’s platform. Users will greatly benefit from this update as they will be given the opportunity to essentially gain a new employee to enhance productivity. According to TechCrunch, Shopify says that Kit has already endured a strong adoption and noticed 5x more customers drive to merchant stores through Facebook advertisements. Now that Kit is free of cost, Shopify is expecting to see even greater growth in the future.